Wedding: The word brings to mind broken budgets, overbearing families, and out dated traditions. I should begin by saying that I generally don’t like weddings. (as you can probably tell) The meaning of the union is often lost in pomp and circumstance. Seating charts, food, center pieces, and invitations should not be the focus of the day. Prince William is getting married this Friday and it will no doubt be a huge gold encrusted event. But I give him the benefit of the doubt. I’m sure he doesn’t have much say in the matter. But I’d be curious to know what he would choose if he really could have the wedding he wanted. I’ve never been to a gay wedding but I wonder if they bring the stereotypical trappings of a straight affair? 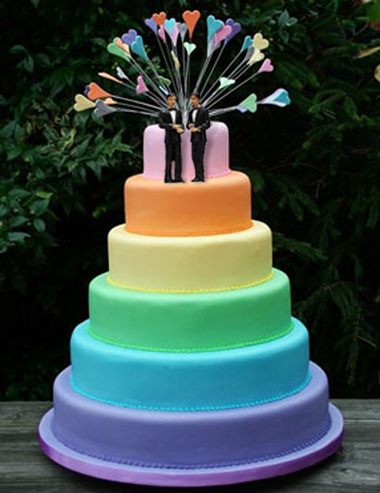 When you really think about it, should gay weddings mimic their straight counterparts anyway? We are not heterosexual and yet a lot of couples copy the traditions of straight culture. Much of the tradition and ceremony attached to a marrying comes from the deep roots of religious and heterosexual politics. For example: The bride is walked down the isle and “given away” to her new husband. I’m sure there’s a Women’s Studies major out there writing a thesis on the topic as we speak. I’m not saying large weddings are bad. I just think your wedding day should be a very personal expression of your love. 1. The Wedding Surprise- Invite everyone you know and care about for a relaxed engagement party. Tell them gifts aren’t necessary. After a bit of socializing surprise the guests with a wedding ceremony. 2. The Escape Wedding- Rather then deal with all the trappings of a large family wedding, run off to a tropical island and getting married in a very quiet and private ceremony.